Cosmo Slots is a classic 3-reel slot machine fitted with 3 paylines. 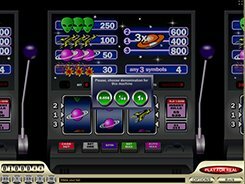 Themed around space and UFOs, the slot includes the following symbols: a fallen star, a planet, a rocket, a green alien, and a flying saucer. A coin size may be customized from $0.1 to $2 by choosing a corresponding colored chip under the reels, and a total bet may reach $6 per spin. After the reels come to a stop, some symbols may appear above or under a payline, or between two paylines. In Cosmo Slots, a winning combination is considered as such when three matching symbols or any three symbols appear exactly across an active payline. Any three symbols landed on a payline award 4 coins. The Flying Saucer is the most rewarding symbol paying out 400 to 800 coins for three of a kind. Landing that combo on the central line awards 400 coins ($800), three Flying Saucers appeared on the top line award 600 coins ($1200), and the highest fixed jackpot of 800 coins ($1600) is awarded for spinning in three Flying Saucers on the third line. Overall, Cosmo Slots is a great choice for low-limit players and novices. PLAY FOR REAL MONEY!